With so many options out there to choose from, we know better than anyone else that picking a Business VoIP provider is no easy task. 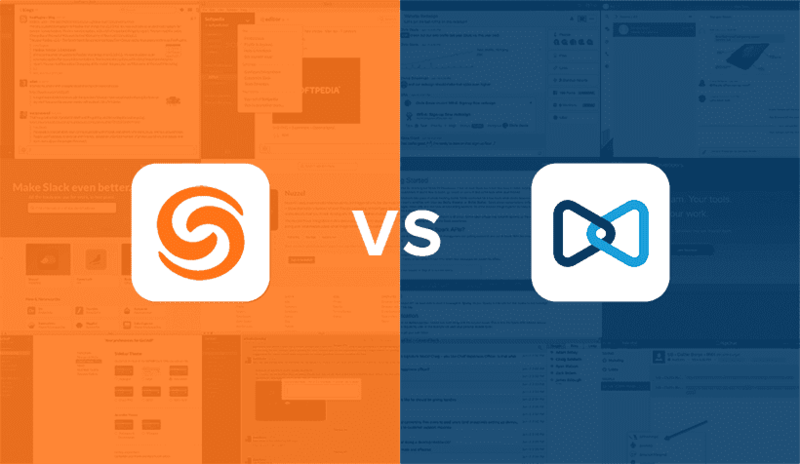 Continuing our comparison series, we wanted to offer a complete profile overview of two major providers, Mitel and their close competitor ShoreTel. Both providers are considered leaders in the market, and would be strong choices for almost any business. However, when comparing solutions and products to the needs of your office, price is not the only factor to bring into consideration. In our case, both Mitel and ShoreTel offer comparable products that achieve comparable solutions – or at least it seems so on the surface. With so many product stacks and offerings available, it can be time consuming and confusing to sift through all the details – so that’s where we come in. With its roots long based in on-premises PBX and UC markets, Mitel now offers a wide range of cloud services from basic hosted or onsite PBX solutions, collaboration tools, to conferencing and even contact center solutions. Mitel’s solutions range from SMB customers up to large Enterprise on-premise solutions. Ranked many times in the Gartner UCaaS Magic Quadrant, most notably in 2016, Mitel has been listed as Leader in the space. They are considered to be a well-positioned provider for midsize deployments in not only North America, but also European and some selected Asia and pacific markets. 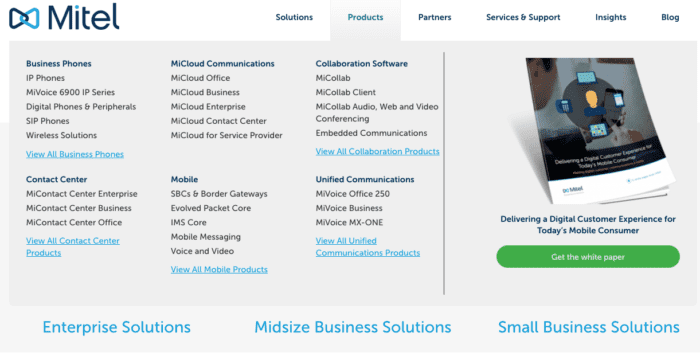 Mitel’s broad range of solutions build off of MiVoice for telephony, MiCollab for collaboration and the MiCloud Contact center. With standalone collaboration and UC platforms, or a robust on-premise PBX and SIP capabilities, or even a cloud PBX for the agile business, Mitel hits the head on almost every nail. They certainly have a product or solution for almost any need in business communications. While still a veteran in the space, but not as quite as old and experience as Mitel, ShoreTel provides businesses with communications solutions with the goal to make interactions as simple as possible. With a portfolio equally as impressive, ShoreTel manages to offer solutions in hosted, onsite or even hybrid PBX deployments, hybrid SIP capabilities, a full UC platform, as well as robust cloud contact center software. ShoreTel has also been included in Gartner’s UcaaS Magic Quadrant, although typically listed as a niche player. They have been listed as a viable alternative for small and midsize enterprises, generally with teams up to 2,000 employees, that specifically seek cloud UC capabilities. ShoreTel’s Connect Cloud was introduced in the second quarter of 2015, and has been rapidly adopted by existing customers and new businesses. The platform does take from the provider’s existing on-premises UC solutions, with their history as a PBX vendor, yet leverages cloud networking for an agile and flexible system. ShoreTel is also noted for their cloud contact center capability. With Mitel known as a visionary, and ShoreTel considered a niche player, the comparison is a particularly interesting one. In fact, Mitel was once considering ShoreTel for consolidation, so the association is not too far off at all. Of course at the root of our comparison is just exactly what each provider offers. We put together a list of the most crucial products and aimed to focus on the closet comparisons. The process was to boil down to the closest Apples to Apples comparison possible. While both Mitel and ShoreTel offer a few products the other does not, we mainly focused on the biggest and most crucial solutions they provide – in this case, IP telephony and Unified Communications. The cloud has rapidly changed the way the world communicates and connects to share information. And despite being a bit of an older player in the space, Mitel is no slouch when it came to keeping up with the times. MiCloud Communications is just that, Mitel’s powerful Cloud Telephony offering, but of course its more than just telephony. The MiCloud platform is of course scalable and flexible, but also powerful with hosted voice, unified communications and even a collaboration platform built right in. With different levels of service from MiCloud Office and MiCloud Business to MiCloud Enterprise, Mitel is capable of putting together a plan that fits each company’s specific scenario. Part of Mitel’s strength is in that they work with a business to piece together the best plan, as opposed to selling out canned or limited plans – Mitel is not limited by what they can and cannot do, they can make almost any solution possible. While the focus is of course on Cloud communications, Mitel does still provide On Premise PBX capabilities with their MiVoice plans, and even a hybrid solution would be available if that’s what your business needs. Also part of the MiCloud portfolio, Mitel offers the MiCloud Contact Center software for businesses that need more than just a simple phone system, or UC capabilities. 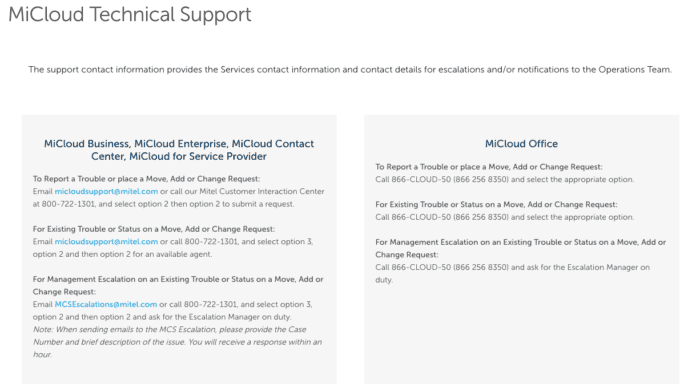 The MiCloud contact center does first require subscribers to utilize the MiCloud or MiVoice platform, and can be considered as an add-on for those that want to expand to include inbound, and even some outbound, contact center functions. The MiCloud Contact Center solution helps a business provide automated self-service options, as well as multiple channels of contact with agents. The MiCloud Contact center includes useful applications such as Contact Center Management, an Interactive Contact Center and Visual Queue for easy configuration, of course an IVR system, and even an outbound dialer and remote agent support. Mitel’s MiCloud Contact Center is also capable of more than just phone, with text, chat and even social media support. Teams that need to develop their own integrations, or integrate their own existing applications with Mitel services will benefit from the MiCloud For Service Providers solution. Through this MiCloud access, users can take advantage of the Open Integration Gateway to work with in-house Mitel developers to build just about any solution you will need. Again, this would range from integrating your own work tasks, building your own VoIP or UC app that relies on the Mitel backbone, or even white labeling licensing services, allowing a business to host Mitel functions on their on servers, and labeled as their own unique product. Mitel’s main product is Unified Communications, and the functions are of course baked right into your Mitel applications. Unfortunately, users cannot separately subscribe to just the MiCollab app, but those with any sort of Mitel deployment will be able to benefit. The MiCollab app combines useful telephony features like call history and voicemail, along with a softphone, with the powerful UC functions we have all grown to use in our daily lives. Of course, IM with contextual and searchable message threads and presence are included along with a MiTeam directory, and even real-time voice and video conferencing, allowing users to collaborate and communicate effectively even while on the go. The MiCollab app is available in both Desktop and mobile formats. The bread and butter of their products is ShoreTel Connect, their own unique IP telephony solution that is just as flexible as any business would need it to be. The platform is built on a single software code base, which essentially allows ShoreTel to deploy the solution as Cloud only, On-Premise only, or a blend of some locations and applications managed in the cloud and others onsite. Users can also choose between monthly subscription operation with ShoreTel managing the entire system, or a license product capital expense that the business controls and writes off over time. One top of it all, ShoreTel connect has the same great UC and Collaboration features we have grown to use everyday built right in. IM, presence, and conferencing are all included with the Connect platform. Continuing on their theme of flexibility and agility, ShoreTel’s Flex Contact Center combines rich inbound features with built-in PBX capabilities as well as mobility and development tools. Essentially, the Flex Contact Center is an add-on to create the one-size-fits-all solution your business needs to gain both IP telephony, UC, and Contact Center functions all at the same time. Included, powerful, development tools allow teams to completely customize and tailor the app to their specific use-case and needs starting from scratch, or building off the existing platform. But on the simpler side, the platform also comes with some great user-friendly features including 100% web-based management with advanced IVR and call routing as well as easy queue management. All with ShoreTel’s mobility and flexibility. If you are instead in the market for a provider to build your own app or platform off of, then ShoreTel has you covered there as well. With their powerful Summit Platform, users can create their own unique SMS or Voice applications. Users can build, extend or integrate voice and SMS functions directly into everyday workflows, to help automate everyday tasks, setup notifications and reminders, alert users with System wide warnings, and drive customer engagement. While ShoreTel does not seem to have their own standalone UC or collaboration apps, all of the great features you would expect in these platforms are included directly in your ShoreTel Connect platform. Users gain access to either the desktop or mobile applications, from which they can audio conference, instant message, check presence, peer-to-peer video chat or even desktop share. These clients also allow for MS Outlook integration to stay on top of your emails. Essentially, ShoreTel Connect has a free version of Slack living right inside. As we tried to offer an apples-to-apples comparison, as close as possible, both Mitel and ShoreTel offer very similar products and included features. The true difference will come down to how your business operates, and what system you need. Mitel offers a very tailored approach, able to combine different solutions to create a totally unique and custom platform that fits your office. ShoreTel, on the other hand, has very strong out of the box offerings and would make much more sense for a business that needs something simple, quick and easy while still offering everything you need for UC and telephony. As we’ve established time and time again, Integrations are incredibly important. Designed to link together multiple platforms and tools, integrations allow us to combine our platforms to improve the way we work. One of the best examples would be the integration of a CRM platform with your VoIP or UC stacks. With customer information directly linked to your UC, users can receive all necessary caller information to best assist the caller and solve the query, and its all available right away so the agent doesn’t have to dig or flip between windows constantly. Mitel however seems to take a slightly different approach when it comes to integrations. With only a few options packaged and ready to go for users, Mitel also provides access to their Open Integration Gateway. This does not mean Mitel’s approach is worse, just different – in fact some may prefer the build your own approach. With so many different versions of apps out there, if your company is using an outdated Salesforce build they might not be able to take advantage of an out of the box integration that calls for the most up-to-date version. So what Mitel’s Gateway does is offers the opportunity for users to build and create their own integrations with just about any business application available, working closely with Mitel developers. Simply put, the Mitel Integration Gateway is the platform that enables other applications to integrate with Mitel Products – and you can build just about anything. Mitel does a really great job of offering the platform you need to customize any integration you could imagine – which is huge. The power is in your business to again, tailor the system to your needs. But ShoreTel offers much more off the bat, with less time needing to be invested to developing a solution and more time just using it. While the Bring Your Own Device trends continues to take off, many businesses will look to reuse their existing hardware when adopting a new provider. While both Mitel and ShoreTel seem accepting of the BYoD movement in terms of mobile devices, the providers still supply users with a list of proprietary IP phones for use with their solutions. Those that are starting fresh and looking to get the ball rolling with a service provider for the first time might not have any gripes, purchasing phones at the same time as your service can mean one less trip to the store or phone call to make. Mitel is actually known for some of their phones, and we recently saw how the provider is expanding into even more modern IP desk phones with mobile integration. 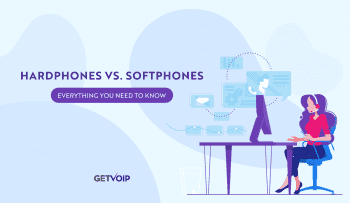 In fact, their list of available hardware compares to that of some manufacturers, with over 20 Business IP phones, 10 SIP phones, 7 digital phones, even analog phones and DECT or Bluetooth solutions, a massive selection of accessories. 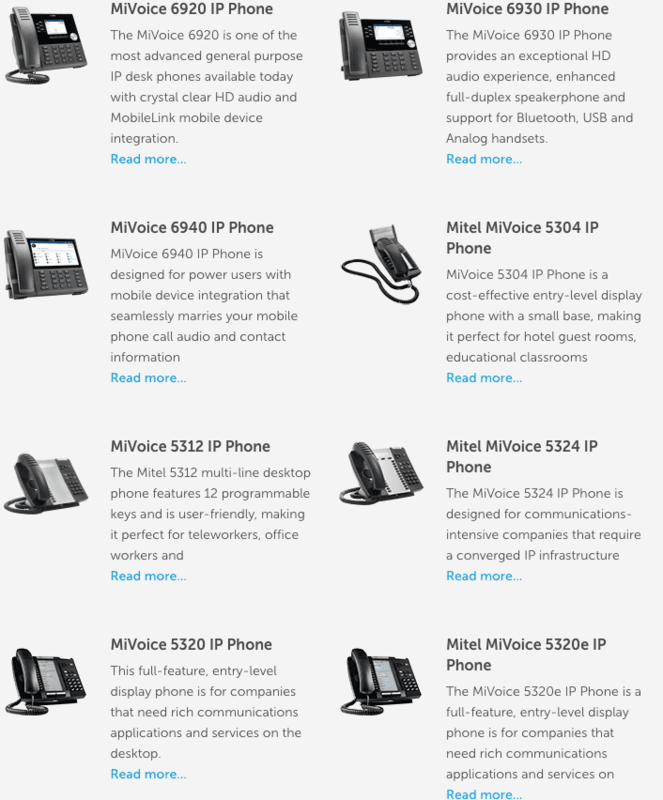 Safe to say, Mitel can also almost be considered a hardware vendor with so many options to choose from. So while you might be limited to Mitel phones specifically when adopting their solutions, there is at least a very wide range of phones and products to choose from to find what best fits your company’s needs and budget. ShoreTel, just like Mitel, also builds and provides their own unique business IP phones for use with their platform. However, there is a bit of distinction to make. In the past, with ShoreTel Sky plans, users could utilize Cisco phones as well as ShoreTel specific phones. However with the transition to ShoreTel Connect, users are much more limited in their options to just ShoreTel IP phones. 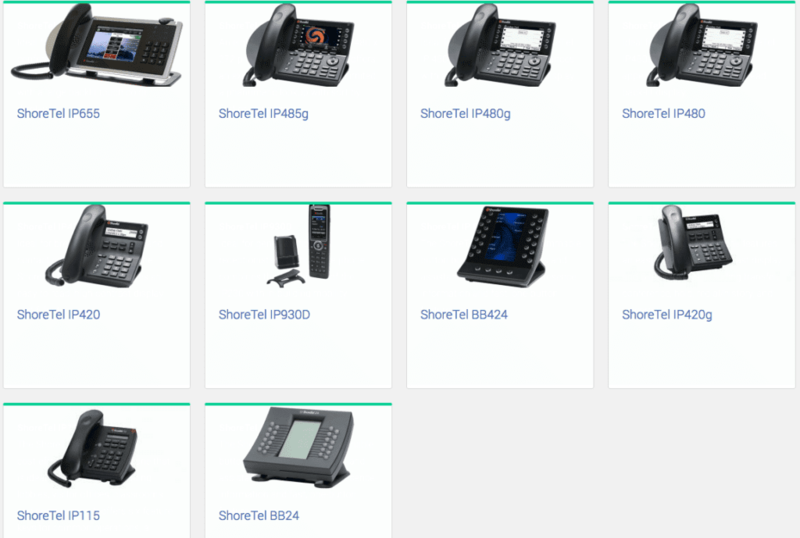 And unlike Mitel, ShoreTel has a much smaller portfolio of available hardware, with closer to 10 different phones to choose from. Although, ShoreTel does also sell different Voice Switches and routers for on-premise deployments, much like Mitel, but they also sell analog to IP phone adapters. The quality might suffer, but if your business needs to keep costs absolutely as low as possible, utilizing old-school analog phones might suffice. At the end of the day, Mitel simply offers more options when it comes to phones and accessories. They even recently launched IP phones that integrate directly with your smartphone, and are continuing to innovate even in the hardware side of things. With more options, a business is more likely to find the phones that best fit their needs. Any business is correct in hoping they will never have to rely on support for their UC or VoIP service. Yet we don’t live in a perfect world, and even the most reliable network can experience hiccups or full out downtime. Emergencies occur, phone systems go down, and emails fail to send – so when the worst case scenario unfolds, any business would also be correct in hoping they have the proper support from their provider to fix the issue as soon as possible. Support comes in all forms, from basic phone-based technical support, to online self-service options with Frequently Asked Question and Tutorial databases. Some providers will even go as far as to include video tutorials and explanations right in your service portal online, or even further with full tailored professional services including technical consulting, and advanced implementation. When comparing providers, we try to analyze how many channels of support are available, as well as any premium support upgrade packages and self-help services on and offline. When users require support for their Mitel systems, the vast majority of the time this will actually be handled by Mitel’s individual partners – the partner that sold your system will ultimately solve any issues regarding the system. However, if your support queries are of a high priority or complexity, or are just flat out technical support requests, Mitel can be brought in to assist. For our sake of comparison, we decided to focus on the Mitel support available online. When it comes to Mitel support, the MiCloud Technical Support center assists all MiCloud users through either a phone call or email support. MiCloud Business, Enterprise, Contact Center and Service Providers are provided with instructions to reach higher tiered agents – with an outline on how to reach such support, while MiCloud Office users are directed to simply call in for any available agent. Beyond that, Mitel does list some of its support functions, including Mitel Software Assurance, Repair Services, Managed Services, Mitel Customer Care and Mitel Performance Analytics. However, worth noting, that it does not seem as if Mitel provides much, if any, self-help options online. But since support is dealt with by partners for the majority of inquiries, it is entirely possible that each partner has their own resource, or access to information end-users otherwise don’t, including resources from Mitel themselves. ShoreTel offers a traditional approach when it comes to support for their users, but doesn’t shy away from online self-service options either. As usual, ShoreTel provides both Phone and Online email support for users to deal with an agent directly. But with such a massive online knowledge base available to all, even without an account login, ShoreTel support really shines. Users can access just about anything they might ever need before picking up the phone or sending an email. 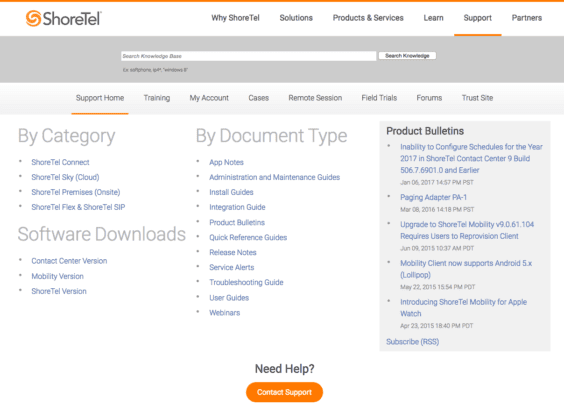 Between in-depth FAQs, How-To guides, video tutorials, simple informational articles, specific problem resolutions and technical documentation ShoreTel lists it all online. Separated by Category, Document Type, or through the general site-wide search users can quickly access any help they would require. One step further, ShoreTel also offers their unique ShoreTel university for hands-on training. There are free “courses” available to all ShoreTel end-users, as well as more specific and targeted courses that users can enroll in to learn even more about their system and leverage everything it has to offer. While we are not doubting the capability of Mitel’s partners, ShoreTel seems to offer far more in the way of support, with self-service options and a massive online knowledge base, online forums, and even traditional support directly from the provider themselves, not just high level technical support. When it comes down to service availability, without a down the category immediately tips towards Mitel. In fact, global availability is one of the major factors that helps Mitel stand out in the industry, with such a wide reach around the world. ShoreTel does a solid job of filling in the largest markets, but it is evident why they are considered more niche than a leader or visionary. Mitel has age and experience on their side. The provider has been around since ’76, and have made great use of the time expanding into a wide market reach. North America is covered of course in the U.S. and Canada, as well as Europe reaching from Spain to Russia. But Mitel didn’t stop there, and they even have availability in the Caribbean and Latin America, as well as Asia and Pacific countries including China, Taiwan, Hong Kong down to Australia. Europe Austria, Belgium, Luxemburg, Denmark, Finland, France, Germany, Italy, The Netherlands, Norway, Poland, Portugal, Russia, Spain, Sweden, Switzerland, U.k. U.K.
On the other hand, ShoreTel managed to solidify themselves with a strong foothold in the U.S. and Canada, as well as branching out into more English speaking international waters with the U.K., Australia and New Zealand. Of course international expansion is never easy, especially when attempting to establish a service network, and the younger ShoreTel just hasn’t had the time to catch up just yet. Although it is worth noting, ShoreTel has as recently as June 2016 partnered with the Chinese provider Ingram Micro to expand offering in Asia, yet the partnership seems to be mostly unrelated to ShoreTel’s presence elsewhere. Unfortunately for ShoreTel, time is on the side of Mitel, and in this case age comes out on top. Mitel has simply existed for longer, allowing them to establish a strong foothold in the U.S. market and eventually broaden around the world quickly. Mitel should be your go-to if international communications are a must. There are many factors that come into play with a decision as large as adopting a service provider, let alone a provider for your business’ communications. In the age of the mobile workforce, your business needs the proper tools to communicate and collaborate at their disposal. But what good is the service if the network behind it is constantly down, or interrupted? If there’s one specific factor that can make or break a provider, far more than the features and products they offer, it can come down to the stability of the network and Quality of Service the provider delivers. Even the best, feature-packed platform can be rendered unusable with a poor network backbone. Thankfully for us, and the many users of each service, both Mitel and ShoreTel engage in a Service Level Agreement with subscribers to ensure a guaranteed uptime. However, there are slight differences in how the providers allow users to monitor the network status, and even the architecture of the network itself. 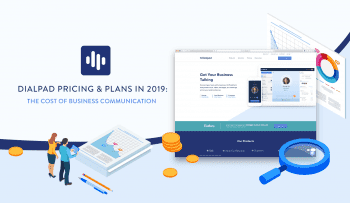 While Mitel does not offer a status or trust webpage in a similar fashion to ShoreTel, it is noted on their road map as a planned addition for this year. In the meantime, we do have some rough network information to go off of as well. Compared to ShoreTel, Mitel has 6 redundant data centers located throughout the U.S., and also does work with Tier 1 carriers to access and leverage the robust PTSN, but Mitel does not disclose how many. With a dedicated ShoreTel Trust Site, the provider helps keep all users in the loop. 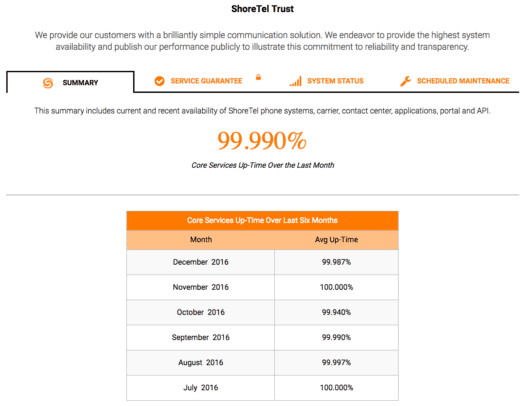 ShoreTel lets users know of the previous month’s Core Services up-time, generally 99.990% , and even going back as far as 6 months prior. A helpful System Status section also allows users to see at a quick glance what is up and what is down, and any updates on service interruptions or incoming fixes. On the technical side, ShoreTel’s network is made up of a range of eight PTSN Tier 1 voice and data carriers to offer redundancy and enhanced connections. Customer data is stored in one central database, which is then replicated to additional data centers closest located to the user. However, it seems that ShoreTel’s main data center facilities are limited to Dallas and Chicago locations. User data is backed up daily and off-site to ensure nothing is lost in any emergency situations. This one is a bit of a toss up. However, when it comes down to it, Mitel has access to more data centers, with greater redundancy. We do not have an exact number, but both have access of PTSN Tier 1 voice and data carriers, but Mitel has already illustrated a stronger network architecture, so this doesn’t necessarily push ShoreTel ahead. While ShoreTel does regain some ground with their Trust website for service status, Mitel at the time of this post has stated they are working on this addition for 2017. Until then, with a stronger network, its hardly a make or break. At the end of the day, either one of these providers could be the right choice for your business. Both are well known, big players in the industry and for good reason. With comparable product offerings, it is not necessarily as if ShoreTel customers miss out on a ground-breaking feature that Mitel customers gain. When it comes down to it, there will be a few specific factors that lead your business in one direction as opposed to the other. Your company is a medium to large Enterprise, with over 1,000 seats. Your business requires a custom tailor approach, possibly a hybrid deployment with only inbound contact center features and a high security concern. Mitel can make this custom made approach possible. International communications are of a priority – whether you do business overseas, or have offices overseas with an HQ in the U.S., Mitel has the network and capability to provide global UC. Your company is a small to midsize business or enterprise, with generally under 1,500 seats. Your business does not require a custom approach, but rather an out-of-the-box setup that can be deployed rapidly, and configured online if necessary. Most of your business is handled domestically or locally.